My daughter, like any normal 4 year old loves to run, jump, play and tumble. When our friend Carrie invited us to meet her and her daughter at Carolina Stars gymnastics located in Fort Mill, SC for their Monday morning open gym, S was very excited to see what gymnastics was all about. Open gym runs every Monday morning from 10:30-12:00, the cost is $5 per child and we had to sign a waiver. The kids were let loose in the gym to try the steady rings, balance beams, uneven bars, vault, play instruments, tumble and bounce. It was a fun experience for a great price. Carolina Stars had instructors on hand to help the kids while trying the gymnastic equipment. I couldn't believe S could hold onto the rings for so long by herself! She was very proud and loved looking at her pictures looking quite Olympic. Carolina Stars also hosts birthday parties, parents nights out and regular classes for gymnastics, aerial dance and karate. We packed a snack and drink and all sat on the floor outside of the gym while the kids ate after working up an appetite. For more information about Carolina Stars you can visit their website at www.CarolinaStarsGym.com. Our daughter is 4 with a wild imagination, and lately its been running a muck at night in the form of nightmares. Nightmares between ages 2-4 are pretty common, but still upsetting to the little ones. 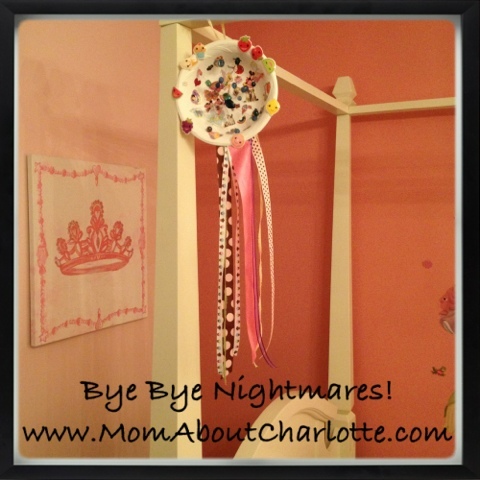 One of the articles I read suggested making a dream catcher. It looked like a fun project, so we had her decorate a paper bowl with her favorite stickers, beads and ribbon. She loved the idea that it would catch all of her bad dreams, and hopefully our project will offer us a nightmare respite. My daughter loves 'My Little Pony' and for her 4th birthday begged that we have a 'My Little Pony' themed party. 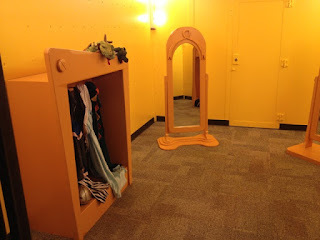 Well I'm all for a themed party, and since she's only little once and is spoiled with too many toys already, my husband and I decided to spend some of her birthday money on an experience instead. We hired About Town Ponies to come to our house for her birthday party. She was so excited, and all the kids at the party were nearly bursting at the seams with anticipation as they each patiently waited for their turn to ride on Magic, a dark brown pony. 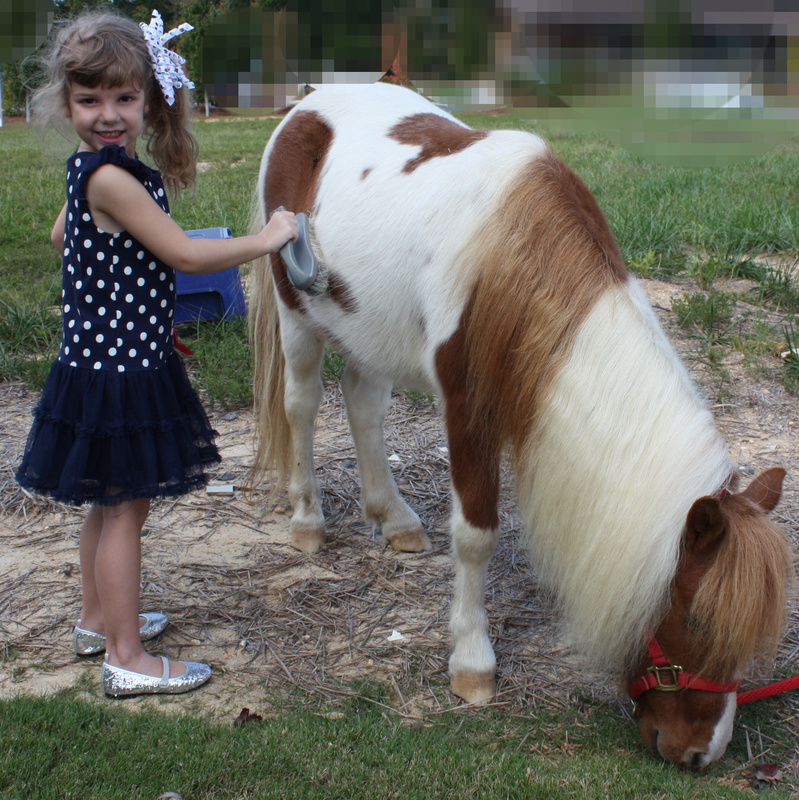 While some kids were riding the others were able to comb and pet Target, a light brown and creme colored pony. You can tell these ponies have been around lots of children, because they were calm and collected, and didn't seem to mind all the little rambunctious hands or squeals. This was a unique party experience for the kids, and many of them still talk about it when they come over to visit. Angie, who owns About Town Ponies was very courteous, prompt and was able to keep the bedlam organized making sure every child got their turn. Angie is an active volunteer for a program that offers children with disabilities free riding experiences, which can be very therapeutic. Birthday parties start at $145 for an hour for two ponies. This includes bringing the horses to your event and any clean up necessary. 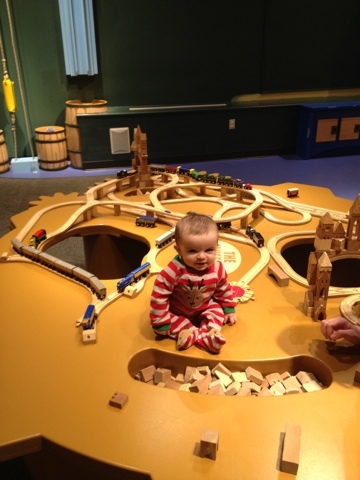 Imaginations run wild at the Main Street Children's Museum in Rock Hill, SC. 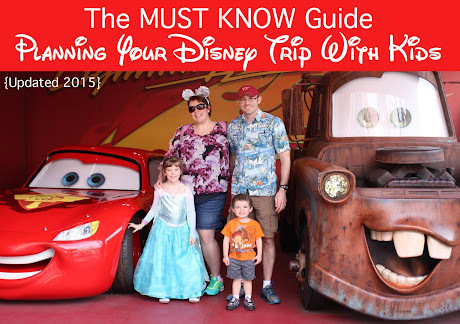 It's easy to get to (about 8 minutes off of 77), has free parking, is an affordable $5 per person and is absolutely adorable. Kids under 1 are free, the museum is closed on Mondays. 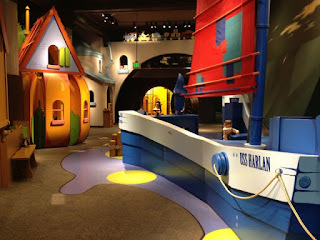 I honestly wasn't expecting the Main Street Children's Museum to be so quaint. 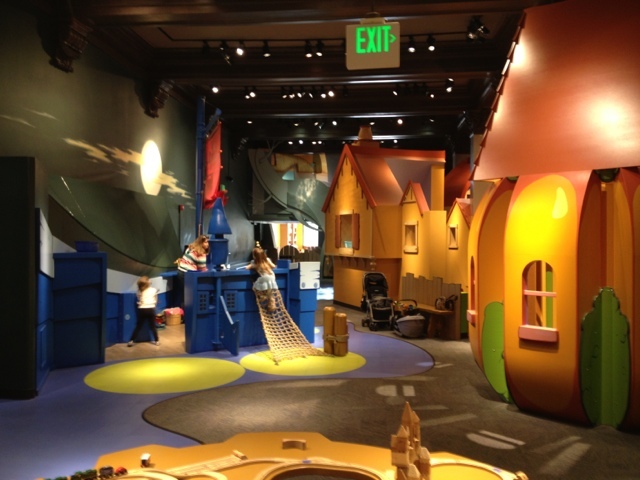 There are nooks to play in, toys to explore and lots of places to climb and be a kid - plus it's so clean and inviting.Previously the museum was an old bank, and transformed its huge vault into a magical dress up area with costumes for girls and boys. 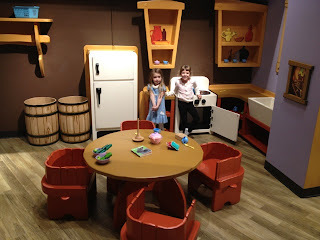 There is a kitchen, puppet stage, boat, large train set, book nook and pulley system for hoisting and moving bean bags . There is climbing to be done! 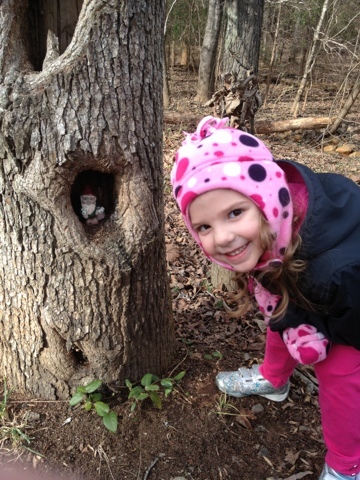 Surprisingly we had the place to ourselves, so S and her friend spent 2 1/2 hours fully engaged in imaginative play. They host craft days, story times and also birthday parties. This is a little gem down in rock hill. Food and drinks aren't allowed, but you can pack a snack to have in the back room. There are several restaurants within walking distance including Jimmy Johns. 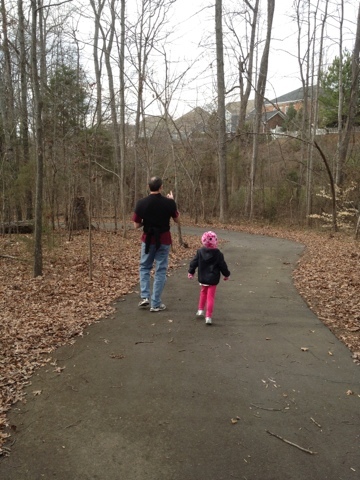 It was a beautiful Saturday in January, so we decided to get the kids out for some fresh air. Hailing from Central New York, I'm always excited when it's in the 70's in the middle of the winter and not -7. We opted to head to Baxter Village to enjoy their nature trails. S insisted we were going to the jungle (her grandparents just got back from an African safari so everything is the jungle), so off to the suburban jungle we went. 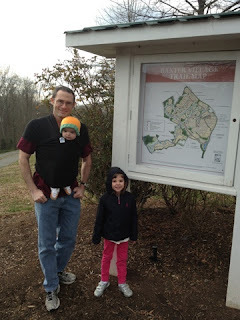 We bundled E in the moby wrap (which this mommy and daddy love) and started our trek, looking for animals (birds and squirrels mostly) and enjoying the scenery. The trail we took was paved, there are several different types of trails - some perfect for a stroller, others for bikes and walking. Click here to see the trail map at Baxter. We came across several geocaches along the way, including a little gnome in a tree. It's a free fun way to get the family into the great outdoors - and it wasn't muddy! 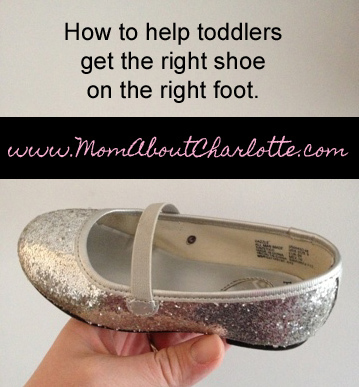 My daughter has trouble distinguishing which shoe goes on which foot. I've tried showing her how to look at the toes and where the buckles are etc. but nothing really helped until I used a black magic marker to put dots on the inside of each of her shoes. Now she just lines the dots up and she knows which one goes on which foot! 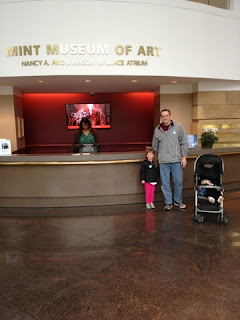 The Mint Museum on Randolph doesn't really jump off the page as a place little ones would enjoy, however they have several activities for kids throughout the week, and S was intrigued by the many ancient tea pots (she's all about tea parties), the pictures (Is that baby Jesus?) and the clothing (It's a Cinderella dress!!) that we came across during our visit. 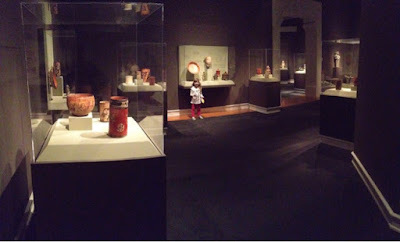 Discovering a museum with kids can seem daunting with so many "can't touches" around, but we used it as an opportunity to teach S about the rules of museums and explained why she couldn't touch it. She accepted the rules and was filled with wonderment with each thing she saw. E was regaled to the stroller but was still interested in all the different things there were to see. 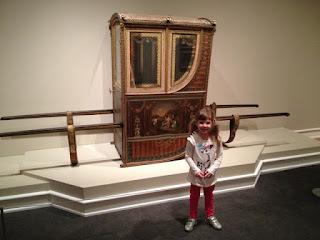 We were able to talk about history of the things we saw, and how the relics were from a time before even Great Grandma Hodges was born - that blew her mind! We also re-named some of the art pieces and made up stories about what many of the items were, it was a fun exercise in imagination for my husband and I. Her favorite part was seeing the "coach" they used to carry members of the aristocracy in (we said it was a princess coach). 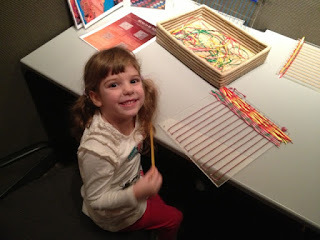 They had a display of Mayan weavings. S and I sat down and tried weaving ribbons at one of the kid-friendly interactive areas of the museum. My husband and I are both Bank of America customers, and they have a great program called 'Museums on Us' that allows free entry to museums across the country. 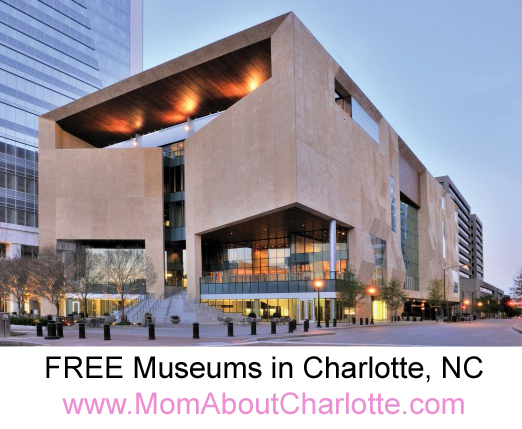 In Charlotte for 2013 it includes The Mint Museum Uptown, The Mint Museum Randolph, The Levine Museum of the New South and Bechtler Museum of Art. It runs the first full weekend of the month - for more information you can click here to read about the program. 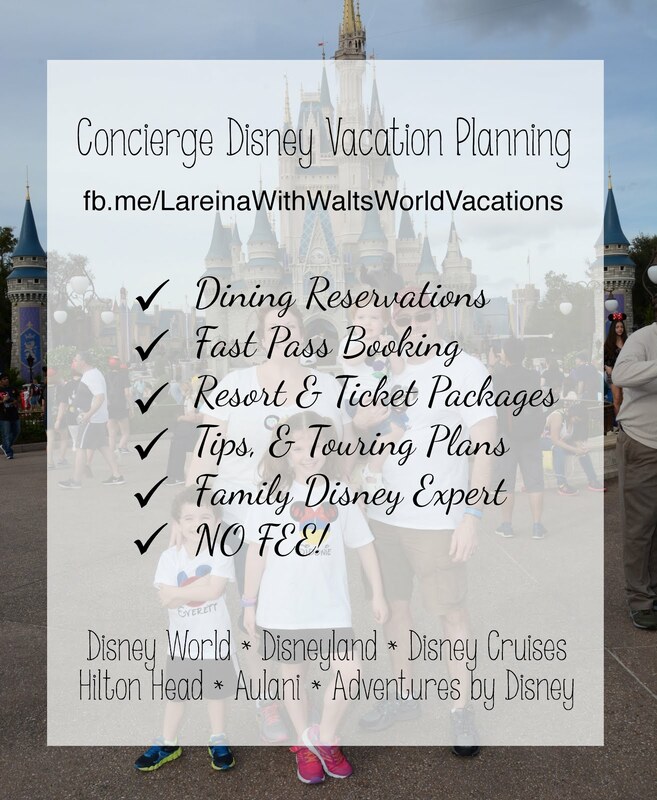 Parking is free and it has diaper changing areas in both the men and women's rooms. 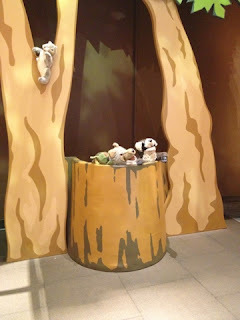 Several benches are located throughout the museum and I was able to sit and nurse E while Jim and S counted tea pots. They had two vending machines in case you forget to pack a drink for the kids or they need a snack. 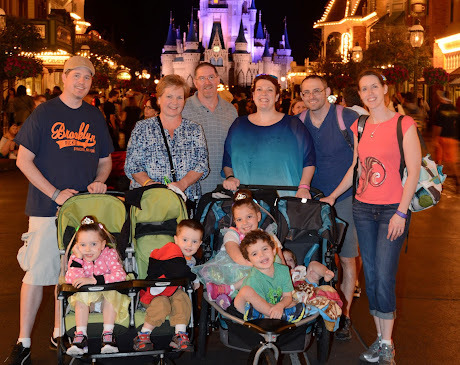 We went on a Saturday around 4 PM and it was very quiet, we only saw two other families the whole time we were in there. It's stroller friendly with two elevators allowing easy access to the galleries.